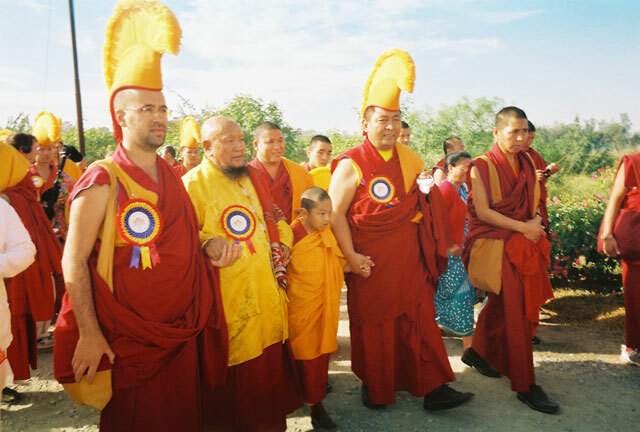 His Eminence Gonsar Rinpoche is renowned to be a firm and strong practitioner of Dorje Shugden. A student from Sera Je Monastery, Gonsar Rinpoche is the root and heart student of Venerable Geshe Rabten Rinpoche and has also received teachings from His Holiness Kyabje Trijang Rinpoche amongst other teachers. 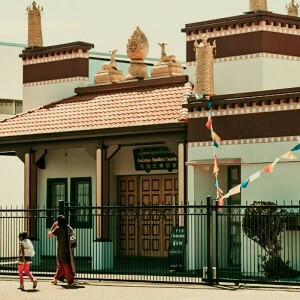 Following in the footsteps of his Gurus to turn the Wheel of Dharma, Gonsar Rinpoche has established several beautiful Dharma centres in many countries including Switzerland, Mongolia and Austria. 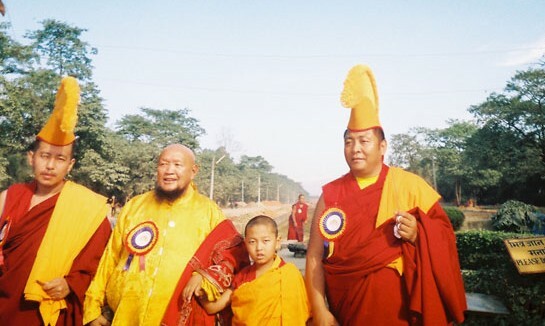 More recently, Gonsar Rinpoche returned to the roots of his religious faith to build a monastery in Lumbini, Nepal – the birthplace of Lord Buddha Shakyamuni. 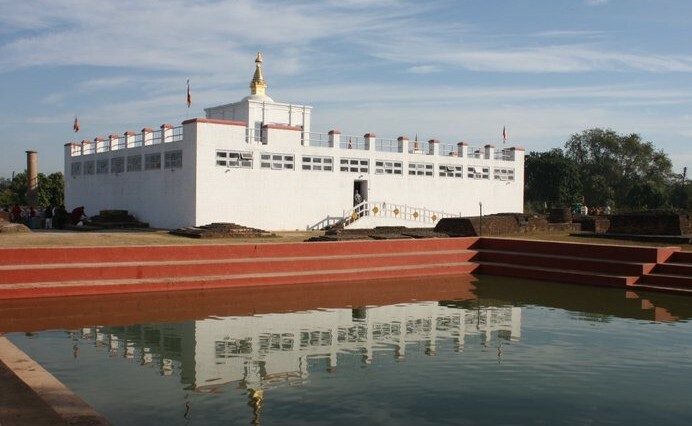 As Lumbini is considered by all Buddhists to be the holiest pilgrimage site in the world, it is a place that is visited by thousands of people every month. 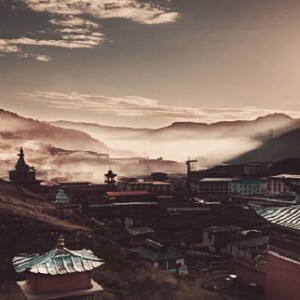 Hence, establishing Jangchup Lamrim Temple there to house the Sangha and spread the Dharma to various parts of the world is extremely auspicious. 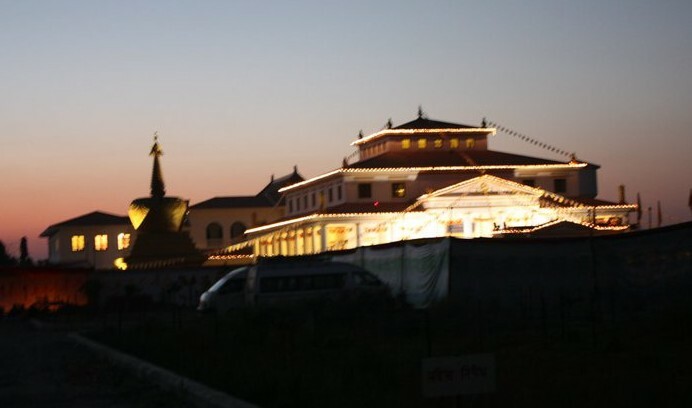 The inauguration of the monastery was a grand one with ordained and lay guests from all over the world. 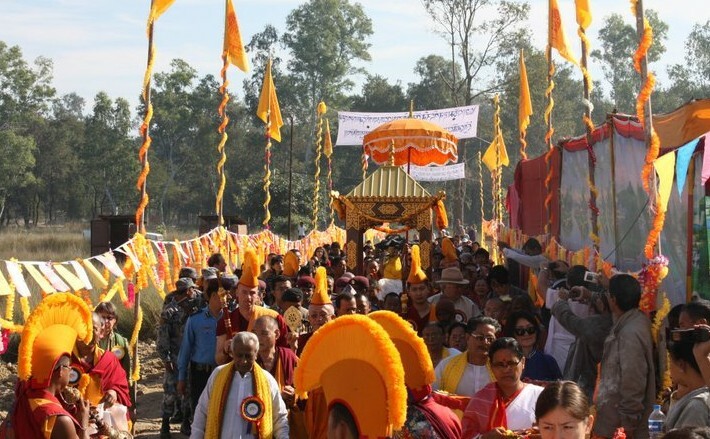 The proceedings began with a ceremony to invite Prince Siddhartha’s statue from Maya Devi Temple to the new monastery with a grand procession. The entourage of monks was regally clad in authentic costumes and the sound of traditional ritual instruments filled the air. 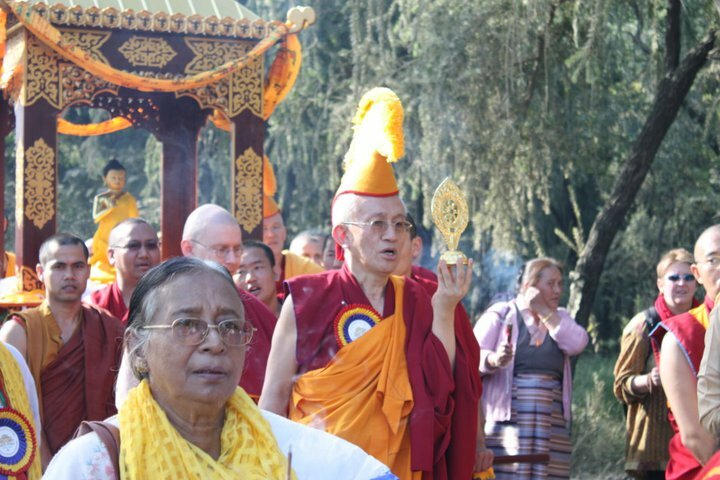 Venerable Jampa Lungtok escorted Prince Siddhartha’s statue to a chariot that transported the holy image to its new home. An elaborate procession of monks surrounded this holy image. Thousands of lay and ordained devotees came from various parts of the world to witness this auspicious and blessed occasion. The event was celebrated according to local customs and traditions. The atmosphere was colourful, vibrant and joyful – devotional songs were sung while accompanied by musical instruments at the head of the procession. 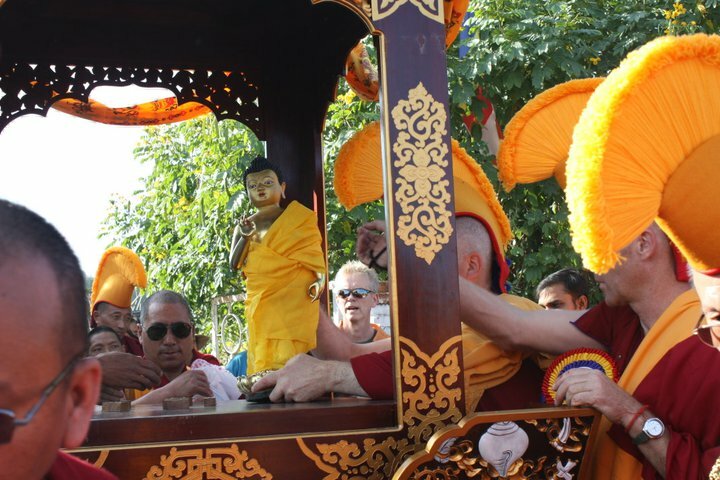 Some sangha members followed the procession from behind and complemented the ambience with Migtsema recitations while others carried the chariot bearing Prince Siddhartha’s image. 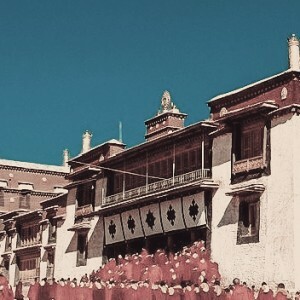 It was a harmonious marriage of Tibetan Buddhist tradition and local culture. The Cultural Minister of Lumbini and the Vice President of the Lumbini Development Committee were among the guests of honour at the event, showing their support for the growth of pure Dharma to benefit the people in the region. The mutual respect between the local authorities and the noble Sangha leaders and members was palpable throughout the event. Guests from different religious faiths, Buddhist practitioners from different schools of Buddhism and visitors from different parts of the world with different backgrounds, nationalities, culture etc. all came together to celebrate the hope that the monastic community can disseminate Buddha’s teaching to the world. This gathering was truly the result of Dharma practice, as diversity was embraced with the common goal to benefit others. Upon arriving at the new temple, the holy image of Price Siddhartha was ceremoniously bathed. To officiate the event, His Eminence Gangchen Rinpoche was invited to give a speech that was translated by Lama Michel. 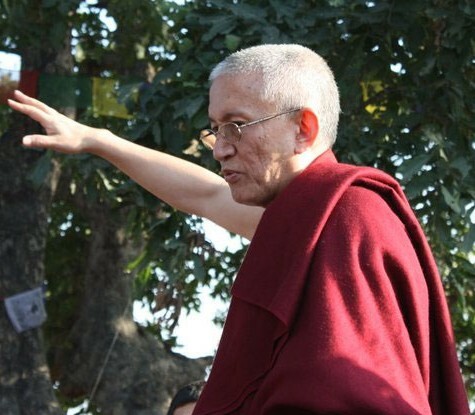 Gangchen Rinpoche told the audience that every religious practice has its roots and for every Buddhist practitioner, the root of Buddhism is Lumbini because this was the birth place of Lord Buddha where the teachings, practice and traditions of Buddhism started. 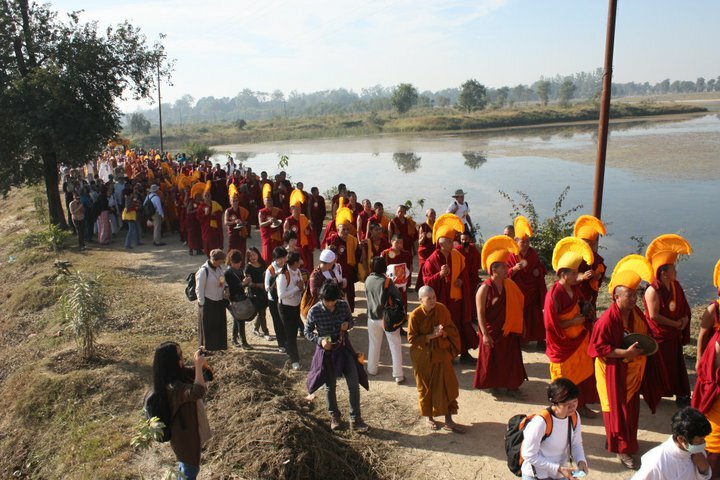 Hence, the opportunity to witness the opening of a holy space dedicated to Dharma learning and practice in Lumbini was very auspicious. 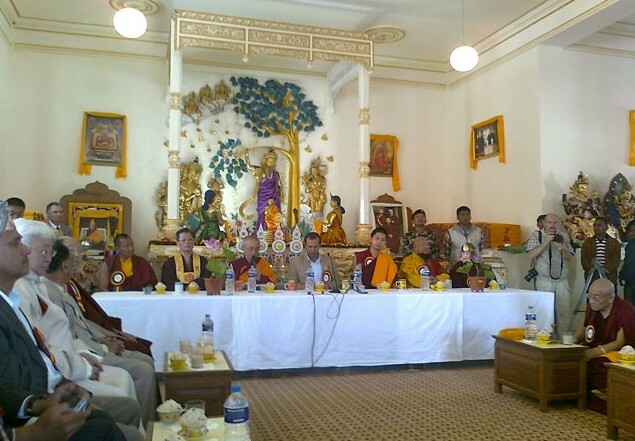 Gonsar Rinpoche also gave a special address to the venerable guests expressing how much he enjoyed working together with them to spread the teachings of Lord Buddha. Between the speeches, Gonsar Rinpoche and Rabten Rinpoche presented gifts to the dignitaries who were present such as the Cultural Minister of Lumbini as well as the honourable lamas who graced the event with their holy presence such as Gangchen Rinpoche, Venerable Anuruddha from the Sri Lankan Buddhist Foundation in Switzerland and the Venerable Abbot of the International Korea Buddhist Foundation. 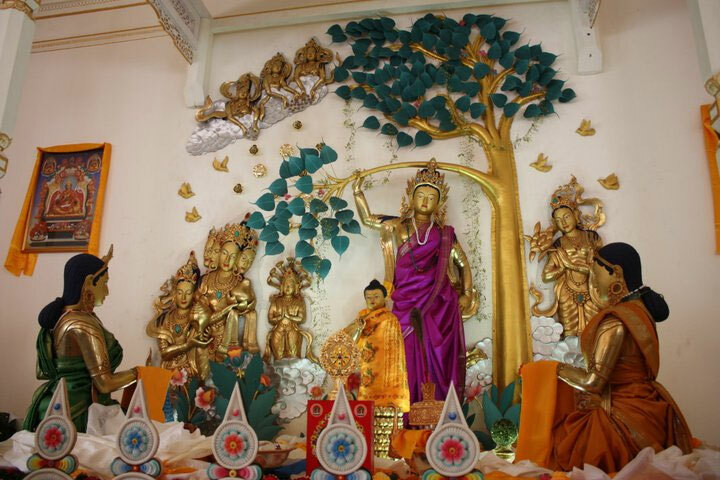 During the event, all three schools of Buddhism – Theravada, Mahayana and Vajrayana – came together. For the local folks who worked at the monastery, a bicycle and blanket were presented to each person. 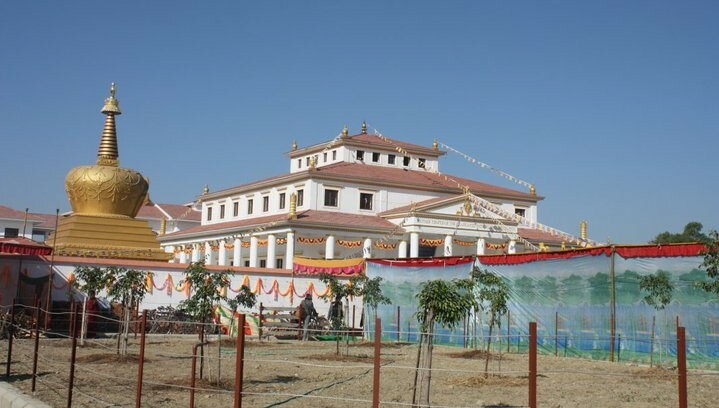 The inauguration of Jangchup Lamrim Temple was a true celebration of Dharma growth in a global society where diversity, collaboration and adaptability have become the path into the future. The festive event came to a close with cultural performances by a well-known Indian group who performed an ancient cultural dance.